Educational Apparel is headquartered in Columbus, Ohio, and since our establishment in 1985, we have been serving the uniform needs of schools and parents throughout the country. 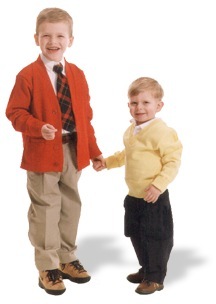 Educational Apparel is one of the country's leading school uniform companies. We sell only top quality brand name uniforms. Our friendly staff is available to help you find the right items in the right size and answer questions about your school's uniform policy. Our goal is to make your shopping experience as easy and hassle free as possible. We have fitting rooms, a fun play area for the kids and comfortable seating for parents or grandparents. Our warehouses are stocked with merchandise year round to ensure that we have what you need when you need it and we stock hundreds of sizes to fit the needs of all children. All of our products are manufactured from only the finest and most durable fabric and are guaranteed for normal wash and wear. Our philosophy is simple -- we treat our customers with the same respect and service we ourselves would expect.